PORT DICKSON, Malaysia - A fisherman here survived a freak accident when he was impaled by a swordfish at Teluk Kemang here on Feb 11. Abu Bakar Bachik, better known as "Pak Abu", 57, and his friend Rosli Manap, 55, were returning from their daily catch when the incident occurred near the PD Marina about 3am. Abu Bakar said he felt like being punched hard in his stomach when he was impaled. "I saw blood gushing out from my T-shirt and realised what had happened," he said when met at Jeti Nelayan yesterday. "I will never forget the sight of the fish flying towards me before impaling me in the stomach right next to my navel," he said. Abu Bakar said the 1m-long fish eventually jumped back into the water. "Rosli steered the boat back to the jetty so that I could be rushed to Port Dickson Hospital," he said, adding it was discovered that his intestines were badly damaged in the incident. "I was referred to Hospital Tuanku Jaafar Seremban (HTJS) where I underwent a six-hour operation." 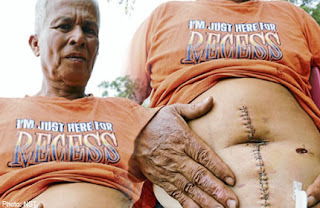 Rosli said that in his 30 years of being a fisherman, he had never been in such an incident. "We have been going to sea for 30 years and this is the first time we had ever been attacked by a swordfish." He said it was common to see swordfish jumping in and out of the water but was shocking to see one impaling his friend. "This is the first incident of its kind for any fisherman here as we had only heard stories of Singaporean fishermen being attacked by swordfish. Now, I have witnessed my own friend being attacked by one." Pak Abu said the experience would not dampen his spirit to carry on as a fisherman because he had already become "one with the sea" a long time ago. "Maybe this swordfish sought revenge from me because my stepdad was fondly known as 'Hashim Todak' (swordfish) because in his youth, he liked fishing for swordfish." He said he did not know how long it would take him to get back to fishing and that he felt sorry his friend would have to brave the sea alone for the time being. "Life goes on, I hope that the Telok Kemang Fishing Association will be kind enough to lend me a helping hand since I am a registered fisherman with the Malaysian Fisheries Development Authority."